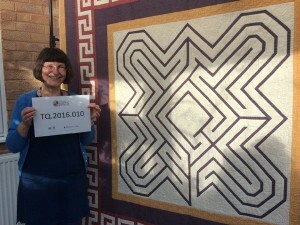 Linda designed her ‘It’s Very Simple’ quilt using inspiration from Roman mosaic floors, labyrinths and Victorian/ Edwardian garden paths. She talks in detail about making the quilt, what it has been used for and why she chose to talk about it. Linda also discusses her lifelong link with sewing, classes at the Workers Education Association and her use of both hand and machine sewing. Barbara Janssen [BJ]: ID number, TQ.2016.010. Name of interviewee: Linda Pardoe. Name of interviewer: Barbara Jansen. Location: Linda’s home. Address: Exeter, Devon. Date: 25th January 2016. Many thanks Linda for offering to talk about your chosen quilt today. Can you tell me something about it? To start of with, the title and the size? Linda Pardoe [LP]: it’s called, It’s Very Simple, and it’s 81 inches by 81 inches. BJ: Can you give a brief description of the quilt for anyone who isn’t able to see a picture at the moment? LP: It’s made of plain colours. 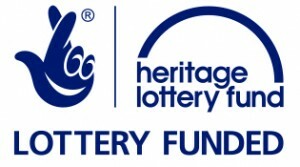 The centre motif is a, a labyrinth and it’s surrounded by several plain borders and a Greek key border. BJ: Okay. 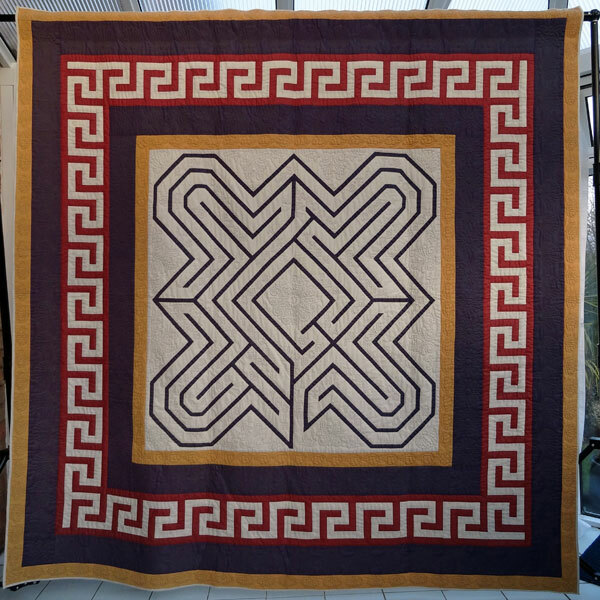 It’s certainly a very striking and unique quilt, what inspired you to make it? BJ: Can I just stop you there at the moment, what’s the difference between a maze and a labyrinth? LP: A maze you can take various blind turns and there’s… you’ll have several go’s getting to the centre, with a labyrinth, if you follow the route, it will take you round all the paths, but it’s guaranteed to get you to the centre. BJ: Okay, that’s interesting. So if you could carry on talking about the source of inspiration. 0:02:07 LP: The other source, was really the colour scheme and because I had two sources that were already ground coverings, I wanted to carry on that and the final one was the colours you get in, in the footpaths and garden path in Victorian and Edwardian houses. So you get the terracotta and the slate greys and ochre yellows. So those were the three inspirations I had. BJ: Okay. How did you go about making it? LP: The first thing was to actually decide on the size. And the labyrinth was the, the biggest challenge, because the photograph was a three… was a perspective picture, and I had to draw it. So I spent several weeks with graph paper failing miserably, before I realized that if you set the graph paper on point, it was actually quite easy to draw. Then I did a full scale drawing of the, the labyrinth centre and then drafted the borders. 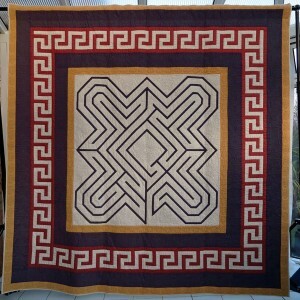 BJ: Is the labyrinth pieced or appliqued onto the background? BJ: Okay. What about the Greek tile border around the outside? LP: And it’s all hand pieced. BJ: Okay. The quilting’s very interesting. Can you tell me about what you’ve done and why? LP: The borders have gone designs that again reflect the idea of Victorian/Edwardian gardens, so I’ve got flowers and I’ve got shells on it. The sort of shells you’d see perched on a, on a flower bed border. The centre was, was more of a challenge as to what to put on it and I decided since it was a labyrinth, with one route to the centre, it would be nice to have a quotation going round it and that’s from Three Men in a Boat, where they go to Hampton Court maze, decide they’re only gonna spend half an hour, and then go and have lunch and then get hopelessly lost. BJ: Okay. So exactly, what is the wording? What is the quote that’s in there? BJ: Okay, so that… hence the title? LP: Why it’s called, It’s Very Simple. BJ: Okay. Is the quilting done in neutral thread or anything in particular? LP: I think most of it’s done in a contrasting thread, yes it is. BJ: Okay, so is it all done in the same colour? LP: No, it’s done in colours that are in the fabrics, but contrasting with the fabric each one is on. BJ: Okay, it’s obviously hand quilted? BJ: Is it hand pieced? Or machine pieced? LP: Hand pieced. In fact, it’s entirely hand made. BJ: When was the quilt made? BJ: And how long did it take? LP: I can’t really remember, but probably about a year. BJ: Okay. What have you done with this quilt? LP: It’s hung on our bedroom wall at various times, it lives in a cupboard quite a lot of the time and it has been entered into the Quilts UK Exhibition at Malvern. BJ: Okay, I think… I remember you saying, it had won an award at Malvern, was that so? LP: Yes, it got the best bed quilt that year. BJ: Which is amazing really, because it’s not bed shaped is it? LP: No, it’s not a bed quilt. BJ: So, they obviously judge their quilts on beds, so it must have looked spectacular on the bed, even though you hadn’t designed for that purpose. LP: Well, the, the central motif actually fits on the size of a double bed. So actually, although it’s a square quilt and it wasn’t really designed for a bed, it fits on a bed quite nicely. BJ: Okay. 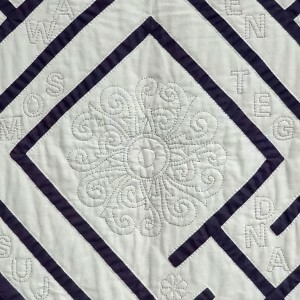 So, is there a particular reason why you chose this quilt as your touchstone object? LP: I think because the ideas where it came from were, were very memorable to me, particularly the holiday we had in Berlin. I had a lot of pleasure making it, it was very different, it was a… it didn’t come from any books, it was purely my ideas and from several sources. And it was also made at a time where dad was very ill and I got the award just before he died and it gave him some pleasure to see it at that time. BJ: Okay. So thank you for spending so much time talking about this quilt. Now I’d like to ask you some questions about your own quilt making journey. When did you start to sew? LP: I’ve sewn all my life, I can’t remember a time when I didn’t. By the time I was about two or three I was certainly sewing. My mum used to do dress-making and I used to have the offcuts. So I, I really can’t remember a time when I didn’t and I started quilting about 33, 34 years ago. BJ: Okay, have you got any bad memories of sewing? Like many people had lessons at school and particularly… so in what way? LP: I had a horrendous needlework teacher in London, a Mrs Hutchings, who used to pick up every piece of work and say, it’s puckered and almost put me off sewing for life. BJ: Okay, but obviously, you know, you won through and it was good in the end? LP: I moved to Exeter [laughs]. BJ: So are you self-taught or have you learnt through books or courses or whatever? How did you get going with your quilts? LP: Originally with quilting I went to WEA classes and that was the Workers’ Education Association, and they ran some really good evening classes and I was taught by Jane Syers who is an early Quilters’ Guild member and I spent two years with her. The first year we did small projects, so it was things like, piping, we did a tea cosy, a cushion, various things like that. And in the second year, we did a sampler block quilt and since then I’ve been largely self-taught with the occasional workshop. LP: Fabric choice was pretty limited then and I remember my first quilt, the problem with finding colours I liked, because all the prints seemed to be in that nasty pink, which I can only describe as knicker pink. And it was quite difficult to find nice colours and I ended up using plain colours, because the choice was better. BJ: Okay. You mentioned you’d been to one or two workshops or, or classes since. Can you tell us anything about… anything that’s particularly memorable or useful to you? LP: Well, over the last few years, since I’ve retired and I’ve got time I can go to workshops, I’ve been to workshops with people like Sheena Norquay and Kate Dowty and they teach you more artistic methods. I have real trouble drawing and I don’t consider myself at all artistic and it’s really quite nice to have people like them to, to spur you on. BJ: Okay. Have you got any favourite authors or exhibitors, who and, and why? LP: Authors… I tend to… odd books I like, there’s a Judy Matheson book on Mariners Compass quilts, that one I really liked and another book which is called, Fine Feathers by… I think it’s called Marion Fonz, it’s out of print now, which helps you draft quilting designs and those two books have been really useful, along with some of the, the older books on quilt blocks. BJ: What about… I know you go to the Festival of Quilts each year, are there any favourite exhibitors that you have? LP: I like Kate Dowty’s quilts, I love her colours there. I like just seeing the variety that’s there, there’s always something new. But this year there was the, is she called Gloria Loughman? LP: I mean, hers… I thought they were beautiful and I hadn’t come across her before. So yes, it’s just nice to see the variety. BJ: Has the style or method of making quilts changed over the years? LP: Oh well, in general, dramatically. I mean, when I started virtually all were made by hand, they certainly weren’t machine quilted. Whereas now you go to exhibitions and there’s actually very little hand work, which I think is a shame. And a lot of it is, is very automated and getting a bit sterile. BJ: Okay. Do you have a preferred style or technique? LP: I still like hand quilting, I love hand quilting, but since I’ve retired I, I did a… I was a scientist at work and I used machinery all during the day and by the time I came home, I didn’t want to see another machine. But when I retired, I actually craved technology, so I’ve started doing machine work, so I do machine piecing and free machine quilting, but I also still do the hand work. So I, I like doing both. BJ: Do you consider yourself to have any particular trademarks of, of your work? LP: I quilt my pieces to death. I do put a lot of hand quilting in things, that’s probably my… and I use bright colours most of the time. I mean, the quilt that we’ve talked about today is actually very subtle, but I do like bright colours. BJ: So where do you get the ideas from, for your quilts? ‘Cause a lot of them are quite unique, you know, as you say, they don’t come out of patterns or books. So where do the ideas come from? LP: They come from a whole range of sources. The colours might be from a piece of fabric I’ve seen, it might be, I’ve been out the countryside, I mean, one quilt was made based on a bluebell wood, just because of the colours there. The designs come from all sorts of places, I love art deco designs, so, we had a holiday in New York and I spent my time photographing facades on buildings. I like art deco jewellery so the, the clean outlines make really nice designs. We go to museums so I, I get ideas from all, all sorts of places and I tend to plot the quilts when I’m on the treadmill at the gym. BJ: Thinking about your latest quilt, what inspired you to make that one? LP: I started collecting… I’ve got into doing Log Cabin quilts, since I’ve done machine work and I’m working my way through modern ones. We went to the quilt exhibition in Alsace about seven years ago and saw an exhibition of, of Log Cabin quilts and we thought we’d go in and see if for about five or ten minutes and went in and went WOW and I came out wanting to do Log Cabin. And I was still working then and I didn’t have the time to learn, but I’m now working my way through various designs and challenges and trying to do modern interpretations of them. BJ: You mentioned challenges, do you ever enter a challenge? And if so, do you find that quite useful or is it something that you don’t particularly enjoy doing? LP: Yes, I have entered challenges. The earliest one I did was actually a Quilter’s Guild one many years ago, called the Scorpius Challenge, which had the most hideous fabric to work with, but it made me think about how to work round the problems. And I also quite like challenges which make you work with different techniques and perhaps different colours to the ones you’d normally use. BJ: I remember that Scorpius Challenge, it was a nightmare, but your quilt, you had taken this really horrendous fabric and had created something with very, very fine points and I think everybody was absolutely amazed and it was one of the quilts that was selected to go on tour. So that, that was, you know, an interesting adventure that I’d forgotten about. LP: Yes, I, I enjoyed doing it. I didn’t enjoy working with metallic thread I chose, but apart from that it was alright. BJ: Well, I think, I too, worked with metallic thread, but I didn’t do anything half as wonderful as you, so I think you really met the challenge in, in a very clever way. Where and when do you sew or quilt? LP: Mainly at home, I have we have a little house. The kitchen/diner is set up as my machine sewing room, the kitchen work surfaces have the cutting mats. In the winter when it’s cold and I can’t get out in the conservatory, there’s a little ironing board that goes on top of my cooker. My hand sewing’s usually done in the living room, but I also go and sew with Exeter Quilters and we have evenings where we get together and afternoons, so occasionally I’ll take my work out and I’ve also been doing a little bit of work for the National Trust recently, so I have sewn out at Killerton House as well. BJ: How does your husband feel about your kitchen being taken over as a sewing studio? LP: He’s fine about it, because he has a spare bedroom as his office [both laugh]. BJ: How do you set about making a new quilt? LP: I start with some ideas, it, it may be the colours sometimes. Sometimes I start collecting colours with a, a vague idea. Then the graph paper comes out, I like graph paper, and I also quite like using Photoshop these days, so sometimes it might be, I scribble something on a graph paper, then I photograph it, then I play with it in, in Photo shop as well. So it’s a variety of ways, but usually there’s a varie… a collection of ideas swimming round in my head. Some of them I work out of my system before I even make a quilt and others don’t go away and have to be made into a quilt. BJ: Can you explain what Photoshop is please? LP: Photoshop is a software programme. I’ve got an old Mac computer, it’s mainly used for photographs. You can use it to correct colours of photographs, to straighten them up, do all sorts of things, but you can also use it if you scan in an outline of a, a picture, you’ve got lines, you can then colour it in. So you can use it as a, an electronic colouring in programme. BJ: Okay, thank you. Going back to your touchstone object, the quilt, described at the beginning of this interview, would you like to say a little bit more about some of the challenges in making it? LP: Well, the first challenge was actually finding the fabrics. I wanted very specific ones, because I wanted to represent or reflect the colours of footpaths and, and… so I, I went to the shop and I could get all the colours and oddly enough the one I thought would be difficult, was the sort of slate grey and that was quite easy. But I couldn’t find a terracotta and in the end we found a pattern fabric and the back of it was plain, so we managed to use that, so that got round that problem. The next problem I had, was when I came to quilt… well when I came to sandwich it together, I’d always sandwiched my quilts with the backing, the wadding and the top on my living room floor, but it meant moving all the furniture out and I’d recently had a, a conservatory, so I thought I’d do it on the conservatory floor and it wasn’t until afterwards I realised that the carpet’s a great advantage, because it holds all the fabric steady and on, on the hard floor it all ruckled up, so I had to re-tack half of it, which was a nightmare. I then had problems, because I use some dark fabric in it, the slate grey, marking the quilting patterns on and getting them to stay and they had to be re-marked out five or six times whilst I actually sewed it. BJ: What did you actually mark it with? LP: Well, the pale fabrics, I use an HB pencil, it’s always my, my choice, but I used a coloured pencil that was actually sold for, for fabric, I think I used a pale yellow one, but the trouble is, they do rub off, they don’t hold on very well. So that was quite a problem and the other problem I had was it was the first time I’d come across cotton wadding, up until then nearly all of it was polyester and I thought cotton wadding would be nice, cotton fabrics, cotton wadding. And this was warm and natural, it was the first one I came across and what I didn’t realise was actually how difficult it is to quilt by hand. It’s, it’s lovely for machine work, it hangs beautifully, but it’s got a, a scrim on, on the wadding and it’s extremely difficult to get the needle through. So hand quilting it is, is very difficult and I’ve never hand quilted with it again. BJ: Thank you for that. Hopefully, the readers here have picked up some hints and tips from this interview about what not to do, even if it, what to do, so thank you for that. If we carry on now, just talking generally about craftsmanship and design, what do you look for or notice in other quilts, either for good or bad? LP: I suppose the first impact is usually the colour and the design. I think it’s always a bit sad when people make very insipid quilts, they may put a lot of work in and they just were a bit bland, so I, I like something with a bit of impact. I then like them nicely made it drives me mad when the piecing is inaccurate and they’re lumpy and bumpy and I, I think that’s a shame. I just like watching… looking at other people’s ideas, something new. It’s not always colours I would like, but just sometimes something that’s a bit different. BJ: A lot of contemporary quilts would fit into that lumpy and bumpy, how do you feel, some of the things that you see? Perhaps at Festival of Quilts? LP: I think most of them are actually the… the standard of workmanship is pretty good these days. I do feel that some are so highly engineered that they have automated machines doing the embroidery on them, that they don’t really look like a handmade piece anymore. So I think they lack character. BJ: Yes, I think often, even though I can appreciate the skill of machine quilting, sometimes they are just quilted to death. Whereas even a medium well quilted, hand quilted quilt has a bit of life to it somehow, but I guess it’s a matter of personal choice. LP: I mean, I, I think probably the most beautiful quilts are quite often machine pieced and hand quilted. The machine piecing is tighter and… than hand piecing, but hand quilting to me, does always win. BJ: If you could own one quilt which you’ve seen, which would it be? LP: Oh, we saw a quilt in Alsace, the first time we went, it was made by a Japanese maker, I don’t know the name. It was just in, a sort of bluey green and white and it was a star quilt and the two of us stood there for about half an hour in front it, just trying to work out how it was made. It was the most beautifully pieced and beautifully quilted and I would have loved to have taken that home. BJ: Okay, thank you for that Linda. This is the final section really of this interview, what do you with the many quilts that you have made? LP: I’ve given some away, I’ll make some for babies and presents, but on the whole I’ve got most of my quilts and most of them live either in a cupboard or in the loft. BJ: …with you, cause I think people much prefer to see the real quilts than pictures of quilts somehow. LP: I think it’s really important that you can get hands on. BJ: What’s the biggest challenge you face as a quilter today? LP: I don’t there’s… I suppose sometimes trying to, to do an artistic quilt and get it actually designed onto paper and make it. Otherwise, it’s just fun really, I don’t look upon it as a challenge. BJ: Why is quilt making important in your life, in terms of sewing, creativity, socially, you know, whatever? LP: I like working with fabric, it’s, it’s relaxing, it’s stimulating, it’s creative. I enjoy designing them, I enjoy sewing them, but I also enjoy the company. Quilt groups tend to be very sociable, we all chat and it’s nice to see other people’s work. So it just wins every way. BJ: Are there any downsides to this hobby or whatever you want to call it, profession? LP: Where to put it all! How much fabric can I store? BJ: What groups do you belong to? 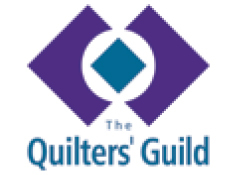 LP: I belong to The Quilters’ Guild, Exeter Quilters and South West Quilters. BJ: Any, any particular favourite magazines you might have subscribed to? LP: I have the American quilt magazine. BJ: Is that the American Newsletter? BJ: Why do you have that one over say any of the British ones? LP: I think they probably have more interesting quilters represented in it and also the English quilts I’m more likely to see at an exhibition, whereas as the American ones, I probably won’t get to see as much. BJ: So thank you for participating in the quilts project… Talking Quilts Project, Linda, and sharing this unique quilt with me today. I hope that the ma… the many people who might delve into this archive in the future will find it interesting.